EpigenDx specializes in targeted next-generation sequencing (NGS) services for affordable, fast, and precise sequencing of custom target regions. Our targeted bisulfite sequencing services can provide methylation data for dozens of genes and entire promoter regions in a single run. Choose from pre-validated panels or utilize our design services to develop a custom library covering your targets of interest. All of our off-the-shelf panels are validated with Pyrosequencing technology. We use Ion Torrent™ technology for targeted gene sequencing and methylation analysis. Targeted Next-Gen Bisulfite Sequencing is more economical and has a faster turnaround time than whole-genome methylation analysis (WGBS or RRBS). It allows you to analyze only the regions and genes you are interested in, and produces higher quality data due to significantly greater coverage of each CpG site. 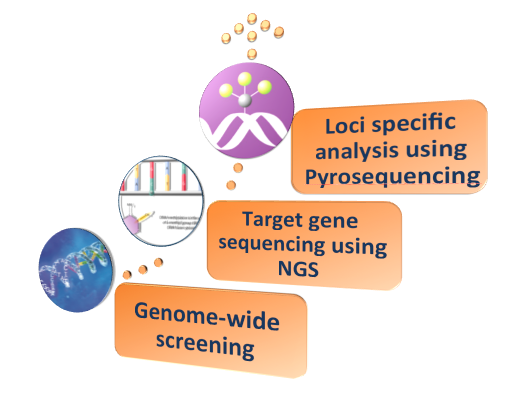 EpigenDx offers a complete solution for targeted NGS. We perform the DNA extraction, bisulfite modification, library preparation, high throughput sequencing, data analysis, and assay validation with Pyrosequencing. We are the experts in DNA methylation analysis with over 15 years of experience in bisulfite sequencing. Measure the percent methylation of multiple target regions (PCR amplicons) and multiple samples in a single run. Use targeted Next-Gen bisulfite sequencing (tNGBS) to select and validate 25-500 loci at a time. Use our pre-validated off-the-shelf methylation panels to assess the methylation levels of genes related to cancer, pluripotency, and more. Send us custom target regions with your genes of interest. We will design and validate a custom panel of assays. 8200 Custom NGS Assay Design Assay design based on customer-submitted target region(s). Includes the cost of oligos.